In the Days Ahead we will be Unfolding the Mysteries that have been HIDDEN concerning these issues, some of which I have already discussed/ and many more, as the Holy Spirit allows. Man kind has been herded like cattle by these Aliens since the beginning of Time, and now all of a sudden people want to find out about them, as if they could actually find out anything that the Aliens didn't want them to find out? As if humans could understand them, and communicate with beings that have been using us, in ways that are passed our understanding. Humans thinking they can do something about this issue just because they want more INFO. Again WAY over our heads. The Time has Come for the TRUTH to be known, and believe me, people are not going to Listen to it, much less like it. Because the carnal mind [is] enmity against God: for it is not subject to the law of God, neither indeed can be. People have their own made up beliefs, and you can not bring them a NEW CONCEPT of REALITY unless it adds up with the Box they have created to Live in. The Reason that they can not know the TRUTH, is they are all using their CARNAL MIND to understand things, that can not be Understood with the CARNAL MIND. These Aliens are MASTERS of deception, and Manipulation of the CARNAL MIND. They Feed the Carnal Mind Dis Information 24/7. through Media/ religion/ etc. This is Called MIND CONTROL. Why in GODS NAME do you think we are told over, and over and over and over and over, to RENEW our MINDS to the things of the SPIRIT??? THE NEW BIRTH is what GOD has Offered the HUMAN RACE to set them FREE from this LOW MINDED life. 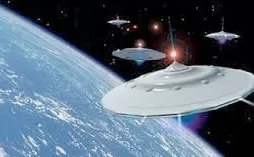 These Aliens have been conditioning Humans to believe what they want them to believe, about DISCLOSER/ Yes its coming, and the HUMAN RACE will believe a BIG WHOPPING LIE/ because they refused to get a NEW MIND. THIS SWORD is for the Removing of CARNAL LIES that DESTROY the MIND. Number One is Religion, then Politics, or some New Carnal Concept of Spirituality. Without the HOLY SPIRIT know one has any idea of what the difference is between, being SPIRITUAL or being CARNAL. All Wars, rumors of wars, Covert or Conspiracy theories/ all Mind Control. This is the Biggest Lie of the Devil/ the Biggest FRAUD that the enemy of this Planet uses/ and it works every time/ Just look at the results of this Sick Programming/ People are now fighting and killing over Religion/ How can anyone in their RIGHT MIND think that is Spiritual? Why would anyone in their Right Mind want to serve a God of Hate? This is TOTAL MIND CONTROL from Birth/ Teaching people from Birth to Hate others, who do not believe as they do is CONDITIONING of the MIND to keep it CONTROLLED to Dis Information, never Questioning it/ just following along like a Dumb animal in a Yoke. That is man, and Religion. Messages sent from outside of Time, into Time, to the Future Time Weavers of the Ages to come.